I love gel/jelly candy. There is something about the texture that always seems to rock my world...sort of like an edible Hugh Jackman, rising glistening from pristine blue water. (Sorry, Gigi just really likes the image.) I also really like Cabernet, but for various uninteresting health reasons I don't get to drink as much of it as I might like to. The idea of getting the flavor of the wine without the aftereffects really appealed to me. 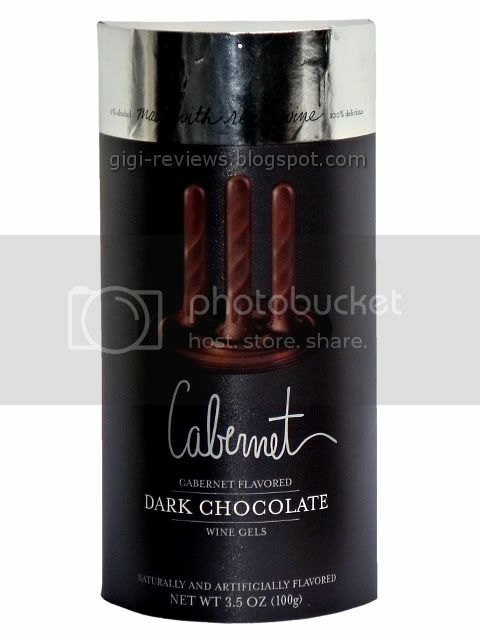 These candies are long sticks of Cabernet wine flavored gels, enrobed in dark chocolate. 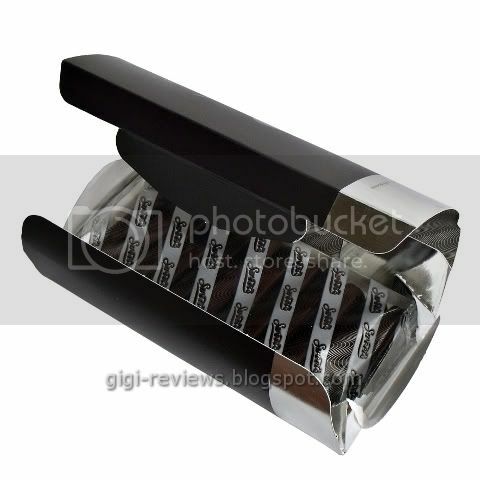 The domed box opens from its side, and reveals the sticks ensconced on a protective bed inside a decorative plastic bag. Each stick is thin and about 2.5 inches long. The sticks are a dark, rich brown and smell sort of like weak wine and chocolate. The candy is in fact made with wine. However, there is no actual alcohol in the sticks. When you bit into the candy, it is very soft and a little sticky. It's incredibly smooth. The chocolate layer is thin and quickly flakes away when bitten into. Really, this candy is all about the gel center. 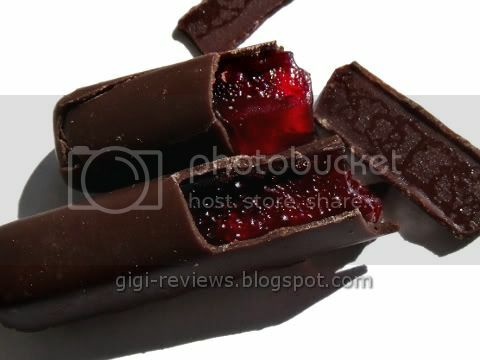 The gel is a shade of stained glass red -- and set against the darkness of the chocolate, it does make for a pretty candy. And woohoo! The gel in fact does taste like Cabernet! OK, you wine snobs out there probably won't be impressed. No, it's not the most high end cab out there, but it's not the worst either. And we shouldn't expect it to the finest. After all, it's just candy, not a cherished, dust covered vintage from a French wine cave. It's sweet, but there is no mistaking it was meant to taste like deep red wine. In my never ending quest to be as thorough as possible I discovered that there is however, a very real, very interesting aftertaste. Once the chocolate flavor wanes and the wine flavors back down the jelly that's left (this is assuming you are simply letting the candy melt in your mouth rather then chewing) tastes remarkably like sugared beets! 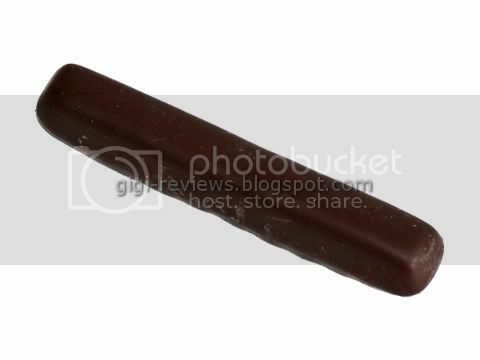 Granted this flavor come up long after most people would have just swallowed and been done with it, so it is not something you will probably notice just casually eating the sticks. I don't know if the taste is caused by the wearing off of the wine flavoring or if perhaps the candy is made with Beet sugar or maybe it's just a subtle tribute to Dwight Shrute. In any event if you wait long enough it's there. So-so chocolate aside I really liked these gels. It's a nice to have a gel option that isn't merely fruit flavored. The texture was addicting and it made me think about Dwight Shrute so how good that be anything other then good? Made on equipment shared with nuts. Kosher, gluten free, contains sulfites. Speaking of gel/jelly candies, have you ever had (the British) Bassett's Jelly Babies? Fruit-flavored soft gels (sort of like very soft, yielding gummies). I spent six years of my childhood in London, and eating one of them brings it all rushing back. LOVE THEM! I have heard of them (wasn't one of the Dr. Who's addicted to them?) but I have never tried them. I have a knock-off version (Norfolk Manor) on my table actually but I was so horrified by the companies Wine Gums that I haven't been able to bring myself to try them yet. I will have to hunt down the Bassett's!